Elison was killed when the car he was driving on the wrong side of the highway collided with a semi-tractor trailer hauling wood chips. 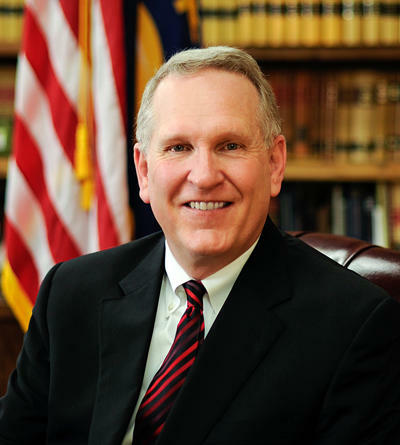 Montana Attorney General Tim Fox. The Montana Highway Patrol is conducting that investigation and Fox says he has not interfered with that process. He’s remembering Elison as a funny and good-natured friend. "Marty had a great life. He died at age 62, but it was a very full 62 years. He has a lot to show for it. A part of me celebrates while a part of me grieves. His family is feeling that way as well." Wednesday’s wreck severely injured truck driver, Brian Leischner. A GoFundMe page set up to help the family pay its medical bills says Leischner is currently in a medically induced coma at Missoula’s St. Patrick Hospital. It’s been a rough week in Missoula. Johnathan Bertsch is accused of deliberate homicide and three counts of attempted deliberate homicide following a series of shootings last Thursday night. Missoulian Shelley Hayes was killed, while Casey and Julie Blanchard were critically wounded. Later that night Montana Highway Patrol Trooper Wade Palmer was shot in the head, face and neck. "Wade is in critical condition. He is stable. He is a healthy guy, thankfully, and so his body is working very hard to heal him, as are the medical professionals at University [of Utah] Hospital in Utah." Fox visited the Medal of Valor-awarded trooper last week in his hospital room. "With [wife] Lindsey’s permission I was able to pray over Wade, I was able to hold his hand and I was able to kneel next to his bed. I spent a lot of hours sitting or standing outside of his room through the wee hours of the night. You know, I hope that does some good." Fox says it’s just too soon to know Palmer’s long-term prognosis. A man killed when the car he was driving on the wrong side of the highway collided with a semi tractor trailer has been identified as 62-year-old Martin J. Elison, of Missoula. The Montana Highway Patrol says Wednesday afternoon’s accident occurred in the westbound lanes of Interstate 90.